When I heard Casa closed down, I was sad. 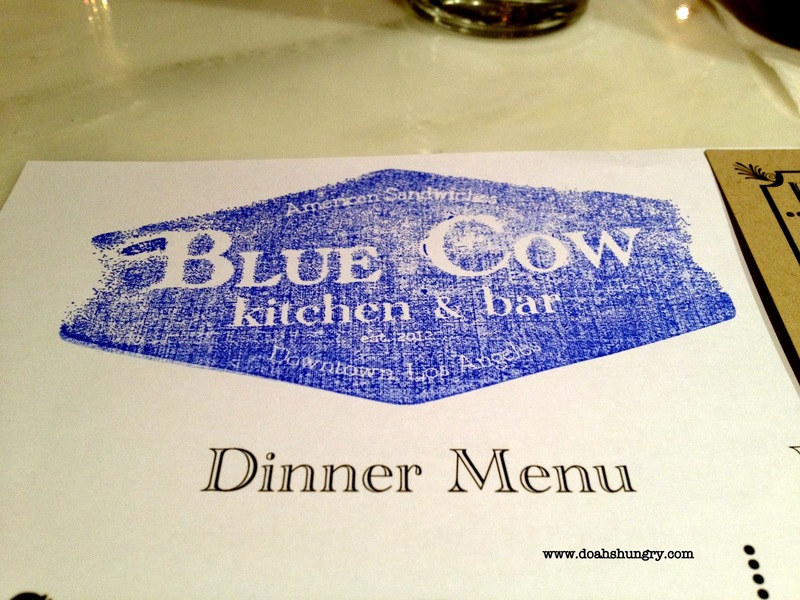 When I heard that Blue Cow Kitchen & Bar was mooooving in, I was super excited. Last night, my patience was rewarded and my expectations were satisfied. So what's so great about Blue Cow? (1) Mendocino Farms is its sister, and God knows I love that place. Win. 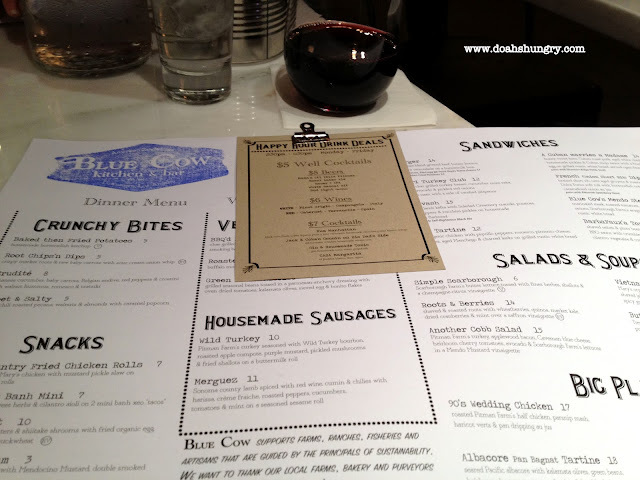 (2) Not only do they serve lunch, dinner, and booze, but it changes its menu every season, allowing a roster of guest chefs to create their signature dishes (namely sandwiches) and allowing you to try different, delicious food. Win. (3) The servers and hostesses were refreshingly friendly and sincere. Win. (4) The ambience is inviting and comfortable. Win. 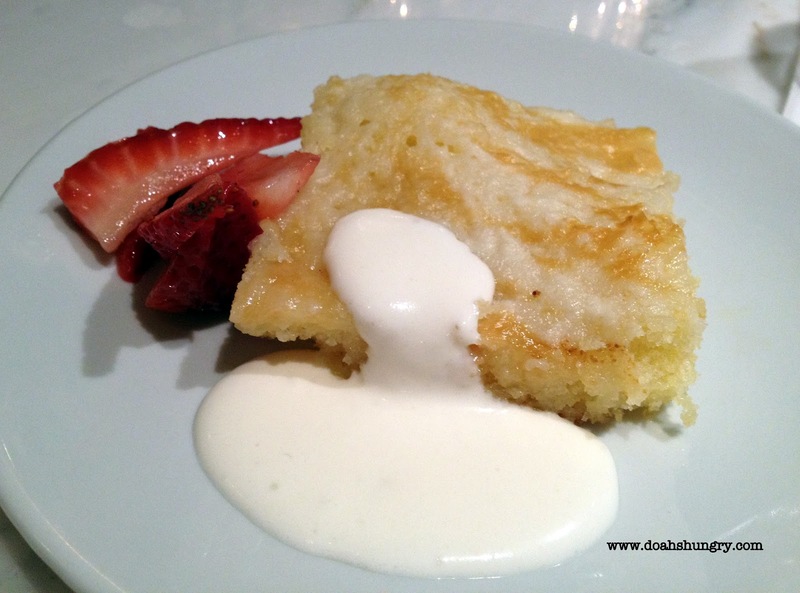 (5) Grandma's Gooey Butter Cake. Win! But best of all, the food and drinks seal the deal. 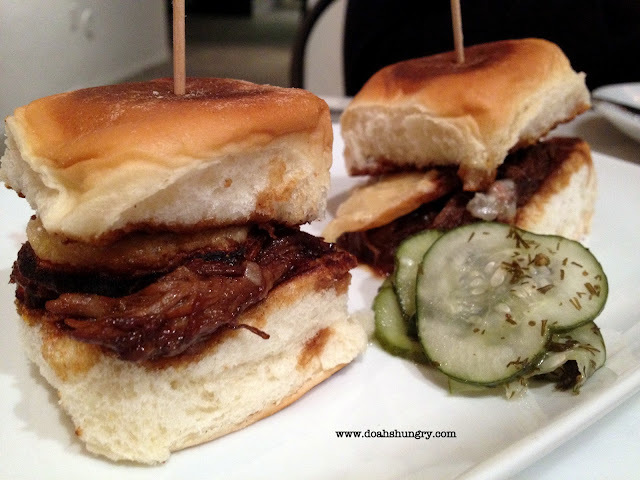 We just ordered off the Happy Hour menu, but after our nibbles, we unanimously decided that we would be back. 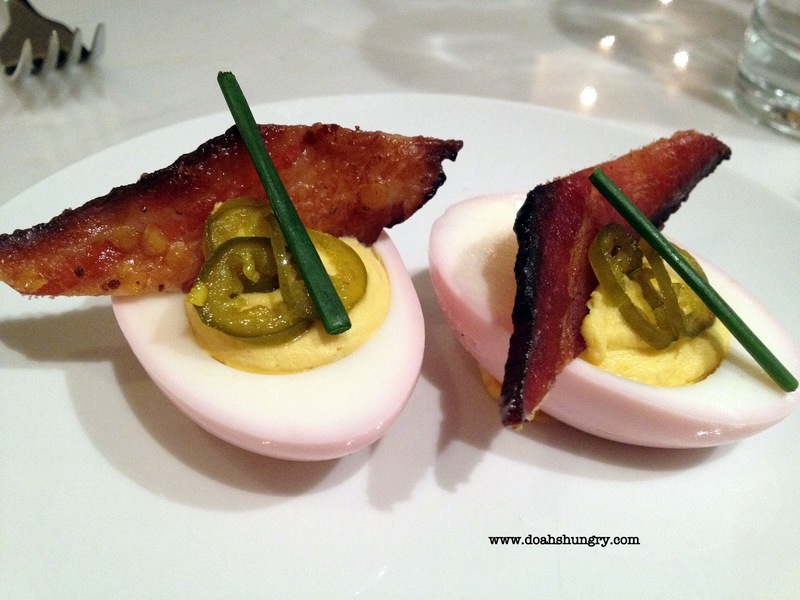 These deviled eggs are beet-marinated hence its slight pink hue. I'm not a huge deviled egg fan, but when garnished with mustard, double smoked bacon, and candied jalapenos, I'll gobble 'em up before you can say "Dr. Seuss." Not pictured are the Baked then Fried Potatoes ($4), which are essentially potato wedges (baked, then fried) and served with horseradish ketchup and Sour Cream & Onion sauce. 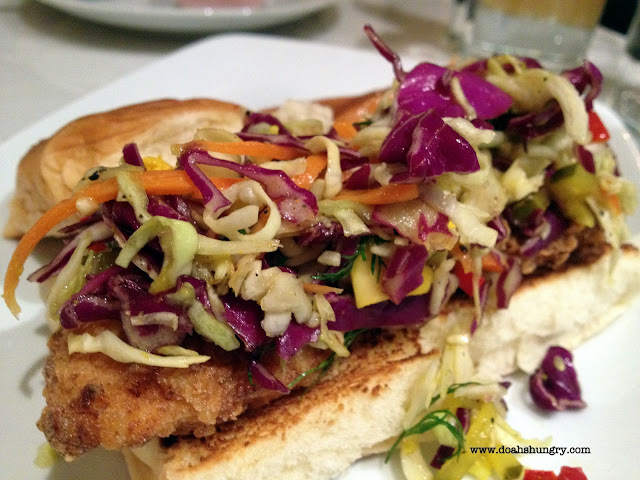 At first bite, the country fried chicken is good, but after a minute, the tanginess of the mustard pickle slaw and the sweetness of the King's Hawaiian roll hits your palate in an unexpected way, and it becomes GOOD. Order this. This sandwich had braised short rib dipped in caramelized onion au jus, cave-aged gruyere, and roasted mushrooms. I don't know what makes "cave-aged" different from any other aged form, but the gruyere was surprisingly crispy and flavorful. The side of dill pickles added a great touch. Order this. Everything we consumed thus far was delicious and convinced me to return to the restaurant, but Grandma's Gooey Butter Cake stole the show for me. I'm not even huge on super dense and sweet treats either, which may say even more about this queen of comfort foods. This butter cake is, well, buttery. So buttery that I thought it was soaked in something. It wasn't technically soaked in anything other than the natural soaking of its main two ingredients: butter and sugar. The top had a slight crunch of pastry and the side of whipped mascarpone cream was heavenly. Order this.... twice. Whether the foods on this review fancies you or not, I suggest you check this place out anyway. Delicious food, affordable prices, great service. What more do you need? *Speaking of phone, all of the above photos were taken by my friend's iPhone4. A great product, indeed. notes: Click here for more info.